Daddy-O earned his “knitter’s husband” badge yesterday. He’s always been supportive of my knitting, even taking me to two yarn shops over the weekend while we were in Asheville for a short getaway. But we came home and immediately drove to the lake to get the cabin ready for “day of knitting” with my Thursday afternoon knitting group. And Daddy-O dove right in sweeping the gigantic porch, uncovering the furniture, buying ice, and even planting new flowers in the pots at the front door. His reward (besides earring his badge) was getting make a hearty plate for his lunch. And also enjoy some leftovers for his supper. We had a feast! 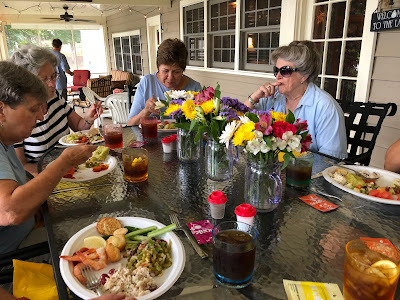 I had invited the knitters for lunch and an afternoon of knitting on the porch. The catch was that they also were asked to bring a salad for lunch. 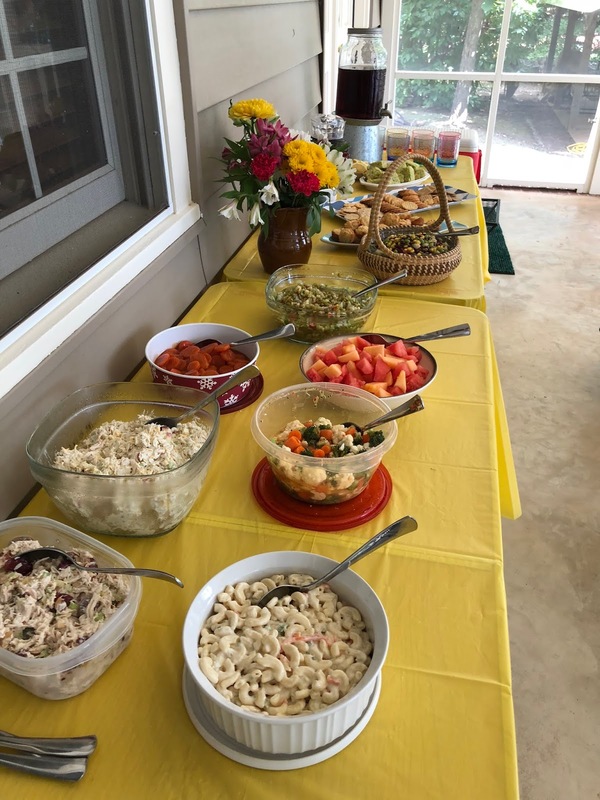 So many good salads, plus a few other goodies were on that table. In the next several weeks I’ll be sharing some of the recipes we enjoyed yesterday. There were several “new to me” recipes, and some others that were good enough to share with you again. These tiny sour cream muffins (also known as sour cream gems—depends on where you got your recipe) are a must for a luncheon. They only take minutes to stir up. Then pop them in the oven for about 15 minutes and they are ready. For reasons I don’t know I patted the tops of a few muffins down so that they ended up with smooth tops. You can’t mess this recipe up, but I did decide that I liked the rough top you get when you just use a spoon to drop the dough into the muffin tin. More crispy edges. Stir together. 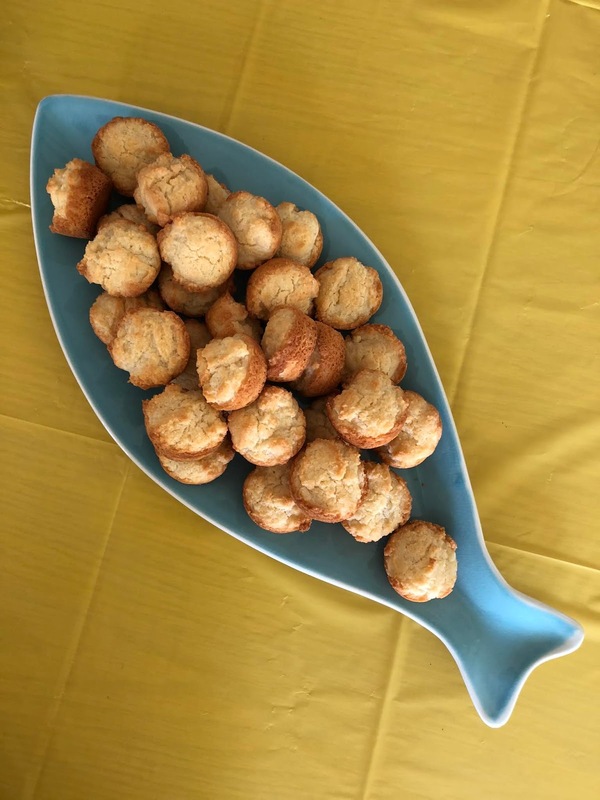 Spoon into greased mini-muffin tins. Bake at 400 degrees from 15-20 minutes. Can be baked until almost done, then removed from pans and frozen. Place on cookie sheet to freeze, then wrap them securely to store in the freezer. Complete browning just before serving. 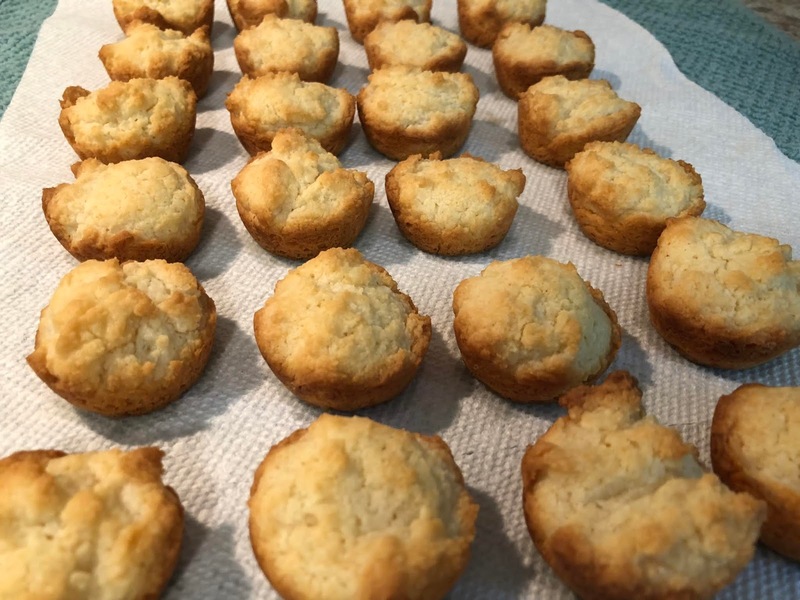 This recipe has been shared here before, but yesterday I was texting with a friend in another state while I was doing the last bits of preparation, like baking these muffins. I sent her a photo of the muffins as they came out of the oven. I know she is a blog reader but she had missed this recipe. Maybe you haven’t seen it before either. So here you go. One of our knitters said yesterday, she wants this recipe to use at Thanksgiving. They can be baked ahead and frozen so it’s a great recipe when you need some make-ahead recipes. We had so many good recipes yesterday that our “knitting mama” (we meet weekly at her business for knitting and visiting) has asked all of us to bring her the recipes we used and she will print out a set for everyone. I will share several of them here with you. Attention all Mimis! Or anyone who needs a fun project for kids. 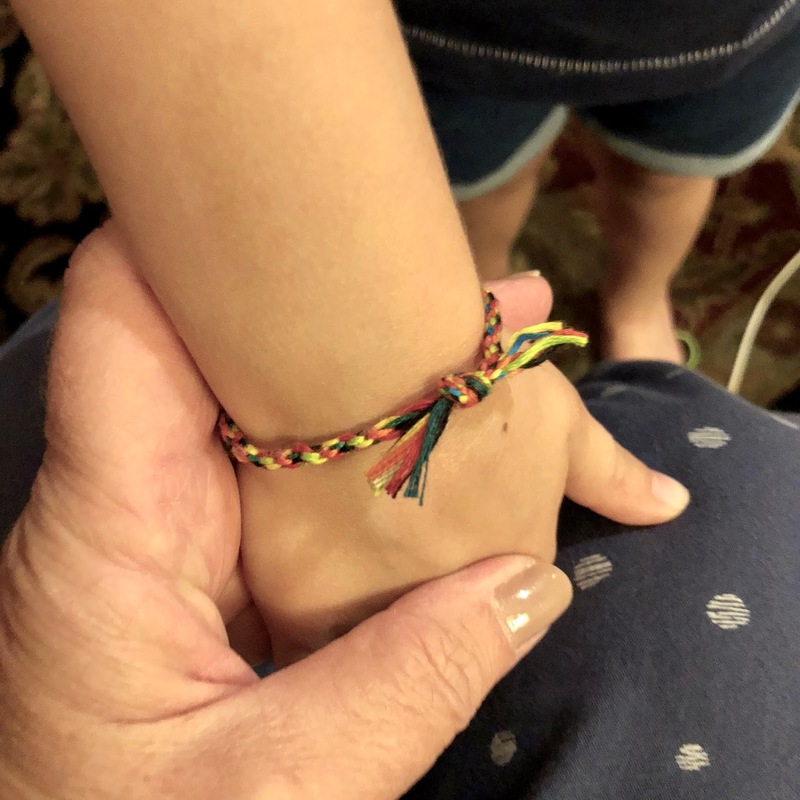 We made these friendship bracelets at Mimi Camp and both girls loved making them. 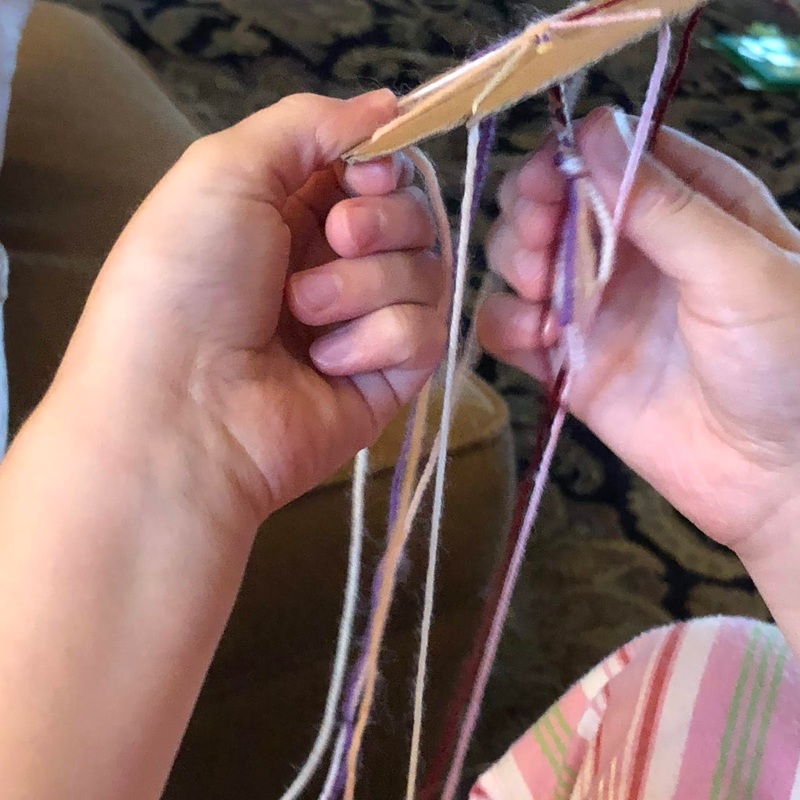 The four year old could do this by herself…after I got the yarns set up in the little loom. (And she taught Daddy-O how while I was taking a shower one night.) And the seven year old actually got out of the wading pool one afternoon to go work on her bracelet. 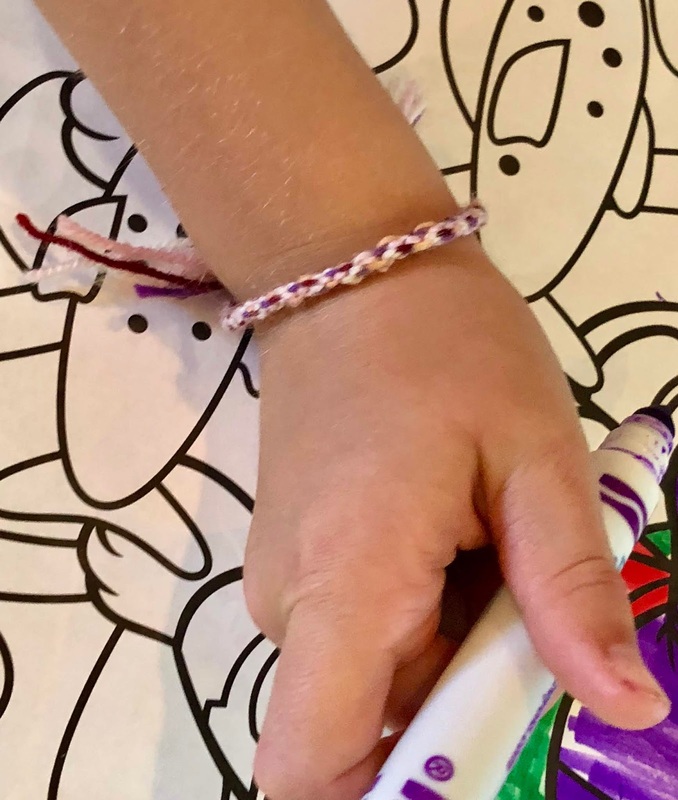 There are so many ways to make friendship bracelets. Some have beautiful complicated patterns. 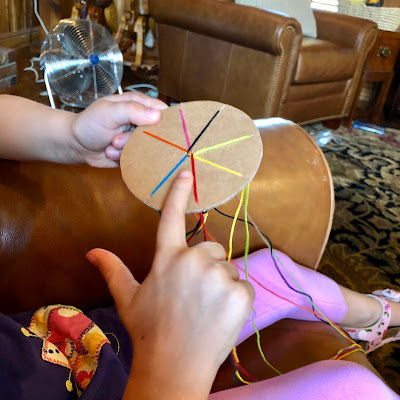 But this method using the cardboard loom is by far the easiest I’ve ever seen. It’s perfect for young children. But the adults who have done this have also found it strangely addictive. 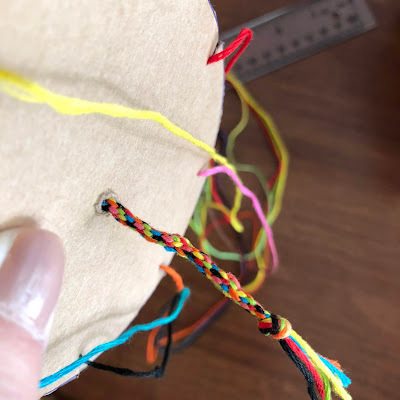 You can find instructions, both written and video, online by googling “friendship bracelet cardboard loom.” But I’ll show you what we did. 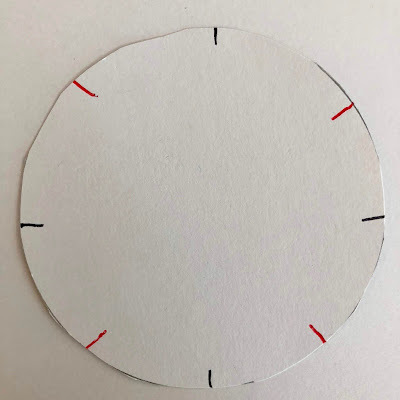 First I cut cardboard circles from a shoebox. I traced the top of a Tervis tumbler to get my circle pattern. Then you mark 8 spot around the circle. You don’t need to measure anything. Just mark top and bottom. Then halfway between those marks, use your pencil to mark the sides. Then make the last marks halfway between the four “north-south-east-west” marks. If you are a little off with your spacing, it won’t matter. I measured nothing! Cut a little slit at each mark, about 1/4 inch. 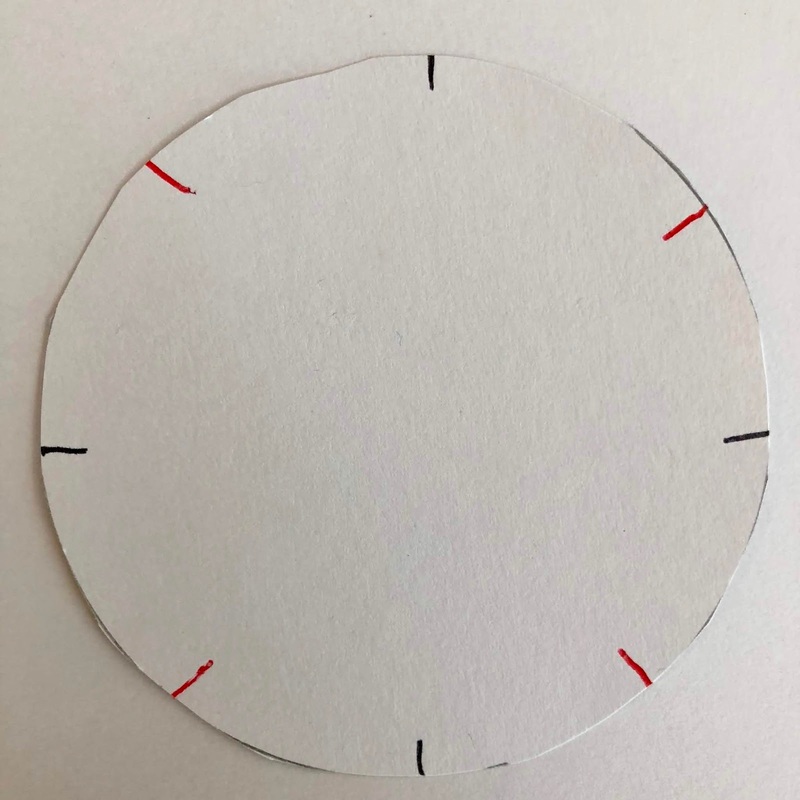 Then poke a hole in the center. I used a nail to make the hole. Then I used a pencil to enlarge the hole enough to get the yarn through it. 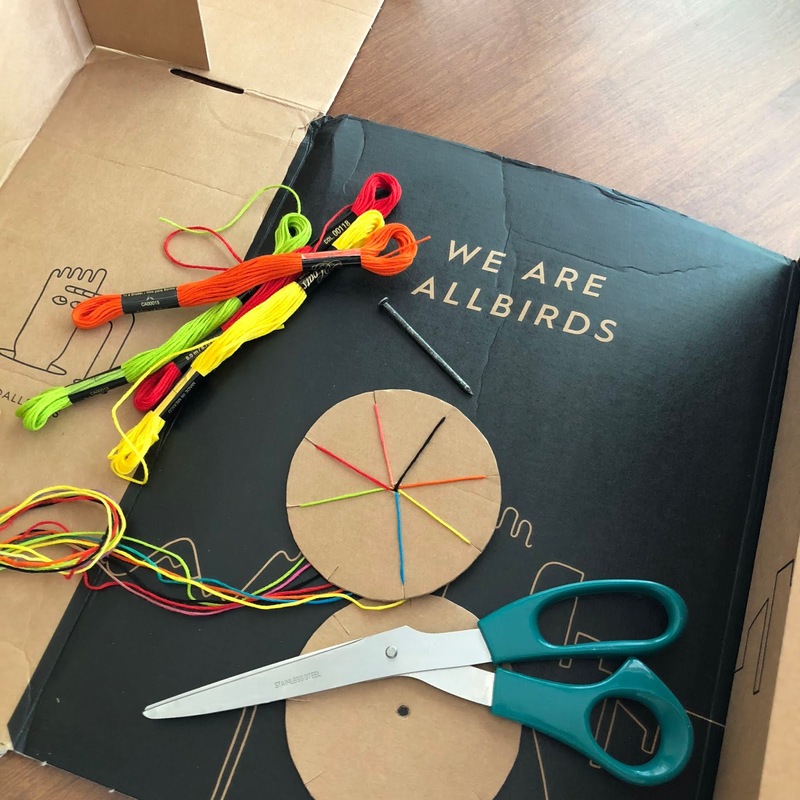 You can use scissors, a pencil, or anything you can poke through the cardboard. Cut 7 strands of yarn or craft cord or embroidery floss (don’t separate the strands) about 20-22 inches long for a child’s bracelet. Make longer strands if you want an ankle bracelet. Or, a grownup bracelet. 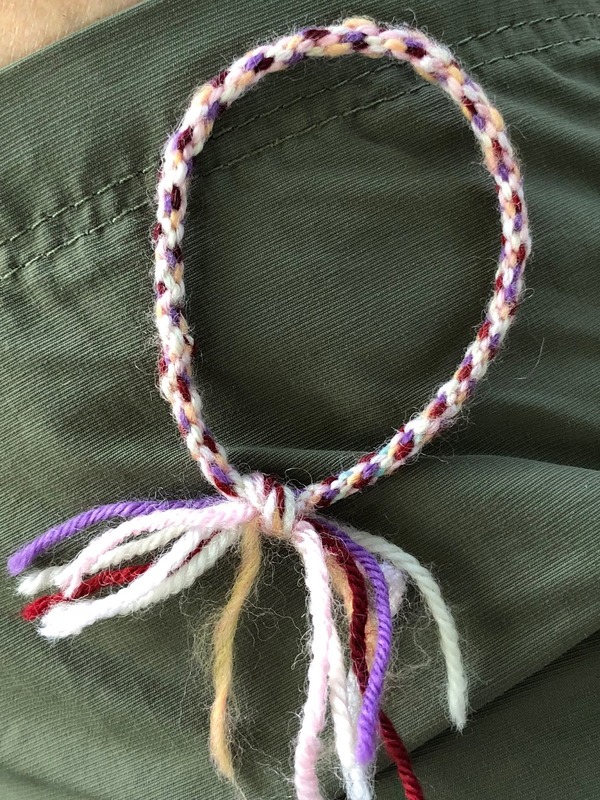 We used leftover sock yarn for one bracelet and embroidery floss for the other. 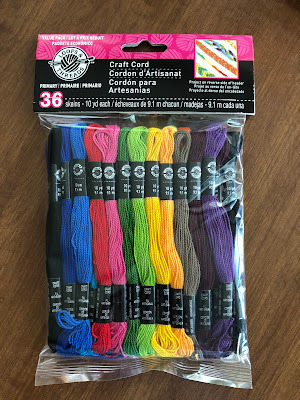 You can buy a package of craft cord or embroidery floss for under $4 at a craft/hobby store if you don’t have leftover yarn at home. 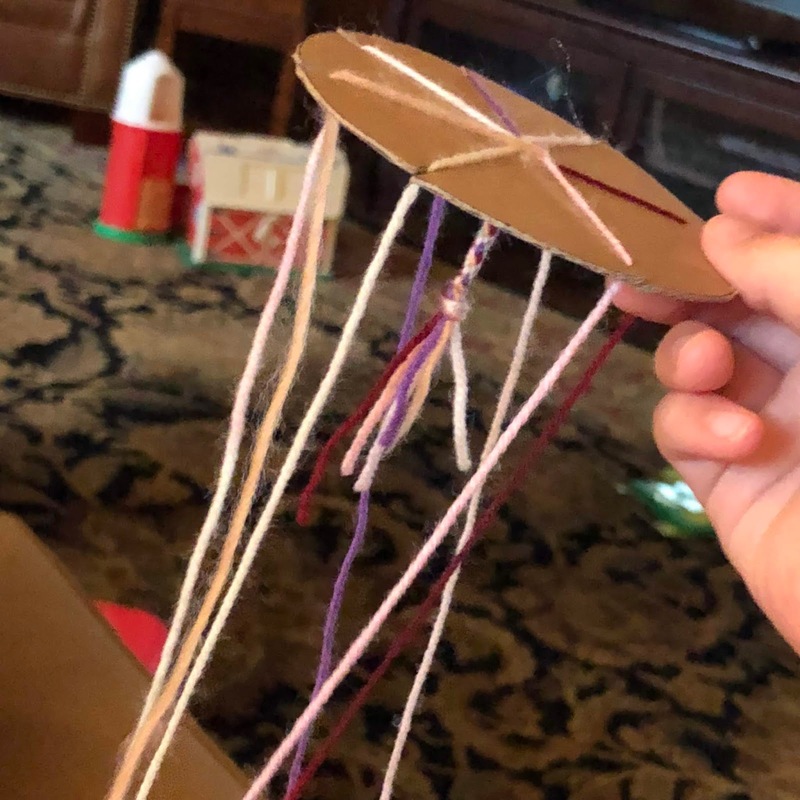 Poke all seven strands of yarn through the hole and tie a knot on the underside (so the yarn doesn’t pull through) about an inch or so from the end. Yes. Tie all the strands together. 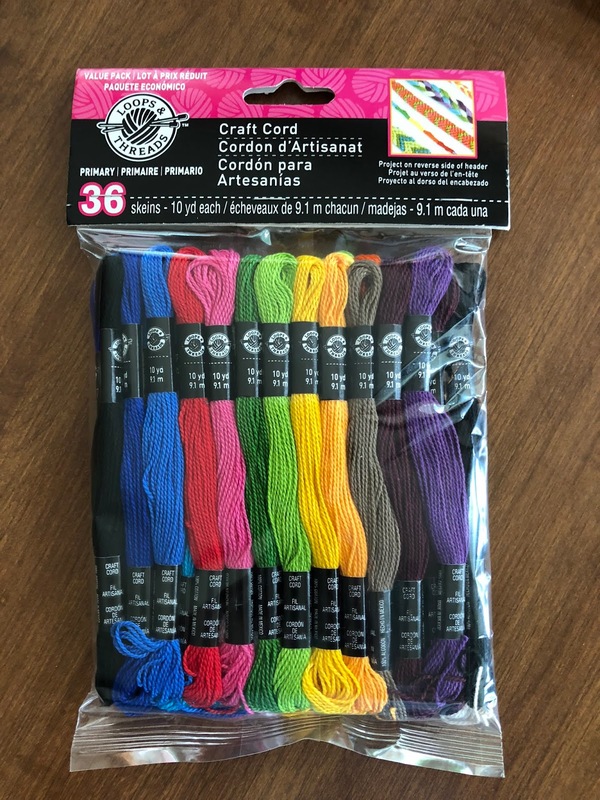 I used a pencil to push the yarn through. 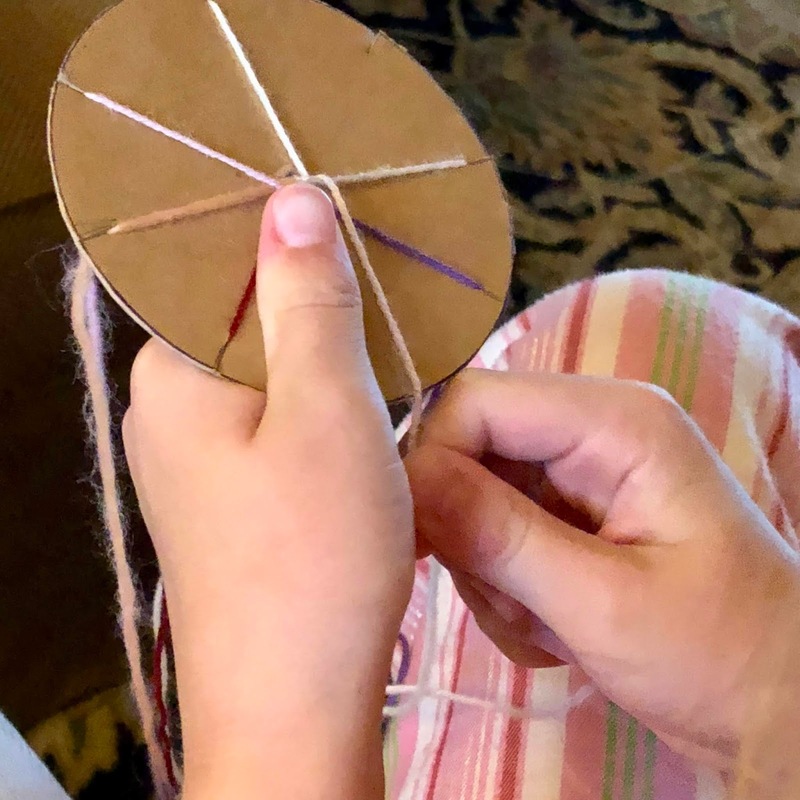 As you continue moving yarn #3 to the empty slot, the braid will begin to grow on the underside of the circle. Give it a tug every now and then to pull it down. 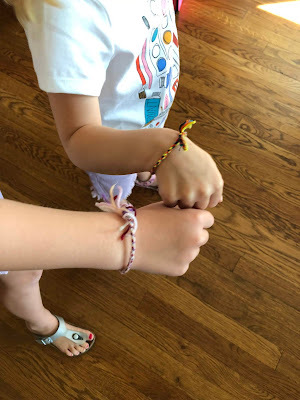 The girls got so excited when they could see their bracelets growing. 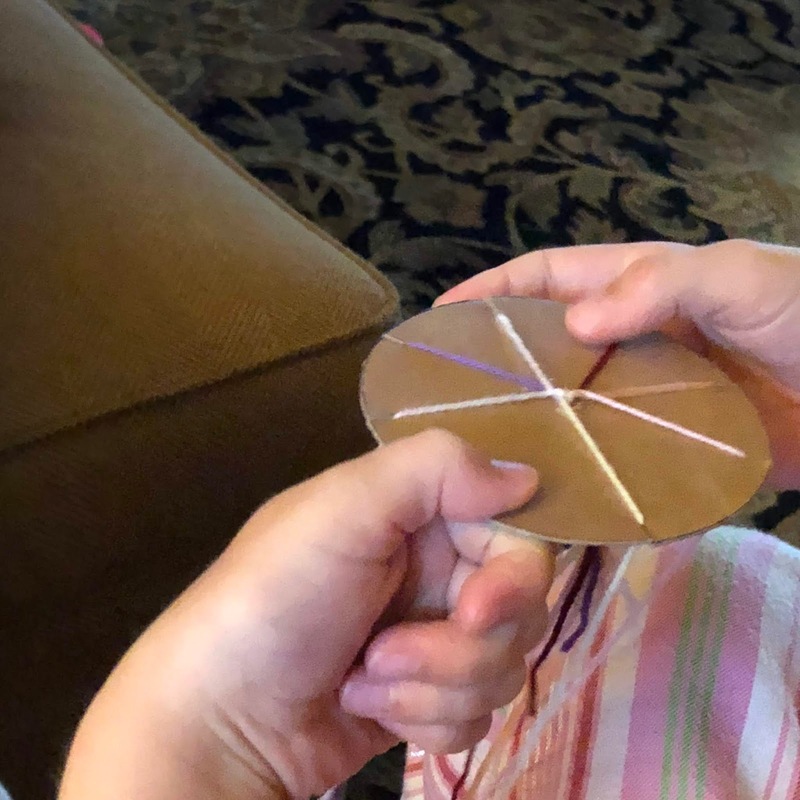 We also figured out that every few moves, we needed to run our fingers down through the strands of yarn to keep them untangled. Just like you would run your fingers through hair to untangle it. When the bracelet is long enough—for these little girls, we made the braid 5-1/2 inches long—take the seven yarns loose from the loom, pull the bracelet down through the loom and cut the yarn a couple of inches above the end of the braid. Trim off the ends (or not) to suit you. We used the simplest of joins. I untied the original knot and then tied the two ends together. You can check this video for other ways to make a join. Make sure you don’t tie it too tightly. I also measured generously and had extra yarn at both ends. That was trimmed off later. 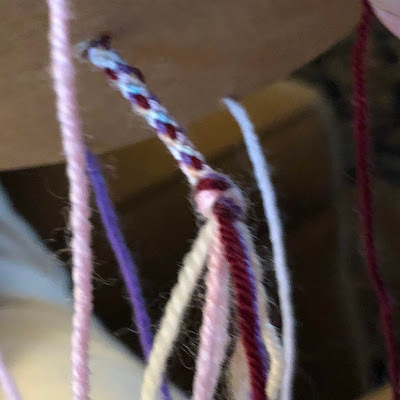 I found it was easier to tie and untie knots when there was enough to work with. Little Sister and Baby Girl wore their bracelets home and asked for me to start another one for each of them so they could work on them in the long car ride home “so we won’t be bored.” That was a grand idea, but Baby Girl was asleep before we were very far down the interstate. But they have their looms set up and ready to go at home.